Did the Manufacturers of Old Steel Chocolate Molds copy each other? *All chocolate molds pictured are available. The answer is yes. There are a few examples in the picture above. The Large display American Santa, 32” was made by Anton Reiche, Germany (One of four), and the smaller American Santa 10” appears to be almost the same was made by Eppelsheimer, USA. The display St. Nicholas 20” was made by Vormenfabriek, Holland; the medium St. Nicholas 12 ½” made by Walter, Germany and the small one made by Walter, Germany. The display ‘Walking Santa’ 20” was made by Anton Reiche, Germany and the smaller ‘Walking Santa’ 12” made by T.C. Weygandt, USA. The antique chocolate molds were tools that the chocolatier used to mold chocolate to sell. 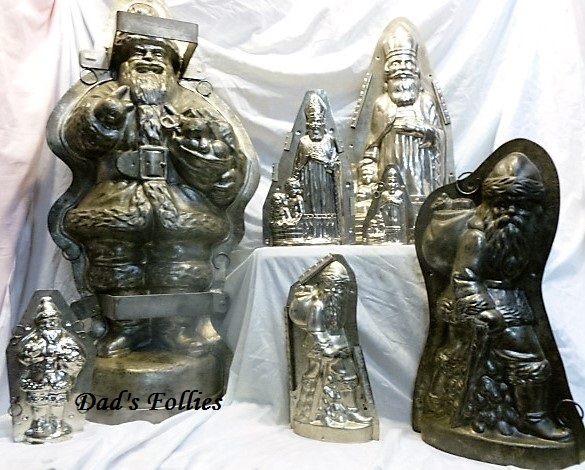 At Christmas for example Santa’s were a great product so to compete the mold manufacturers had a tendency to copy a mold that was selling well from their competitors, possibly offering it at a better price. In the case of T.C. Weygandt he was forced to become a manufacturer when he could no longer get chocolate molds from Germany in the late 1930’s as Germany was preparing for war. This practice makes it challenging to identify the old metal chocolate molds. Can you imagine in 3016 collectors trying to identify cell phones, cars or video games : Who made them; Where they were made; When they were made and How they were made? This entry was posted in Uncategorized and tagged Antique, chocolate molds, Metal, unique gift, Vintage. 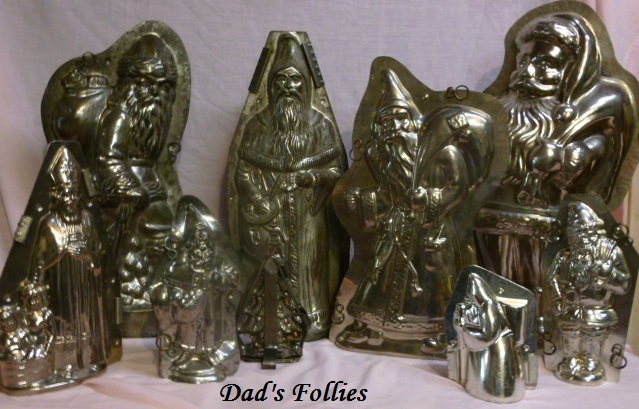 Are old metal chocolate molds hard to find? question on chocolate mold maker mark…..